We’ve only just seen that statistically there never was a recent ‘pause’ or ‘hiatus’ in warming when two articles show up explaining the pause that wasn’t. A key word here is statistically. No-one is suggesting that there may not be variations from time to time that do not breach the trend. Also climatologists are always interested in understanding the physical mechanisms behind both short-term variability and longer term trends. First, via Carbon Brief there has been a new study examining the impact of aerosols from volcanoes. Virtually all research into the climate influence of volcanic aerosols has used satellite measurements of particulates in the upper atmosphere (the stratosphere). These satellite measurements only monitor the volcanic aerosol at heights of 15 km and above. The new paper by David Ridley and colleagues studied the amount of volcanic aerosols in portions of the stratosphere that lie below 15 km. Estimated volcanic cooling from this source is not included in climate models. 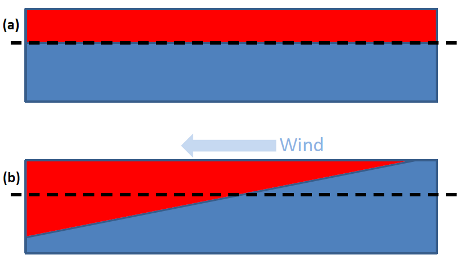 A second study looks at the influence of Pacific winds on warming since the 1890s. They did this by analysing the chemical make-up of corals. The coral record suggests, for example, that trade winds were weak between 1910 and 1940 when the Earth warmed by 0.4 degrees, and were strong from 1940 to 1970, during a period of relatively little increase in global temperatures. Apparently the winds have been very strong since the turn of the century. We don’t know the future of volcanic activity, nor when the Pacific wind pattern is going to switch. 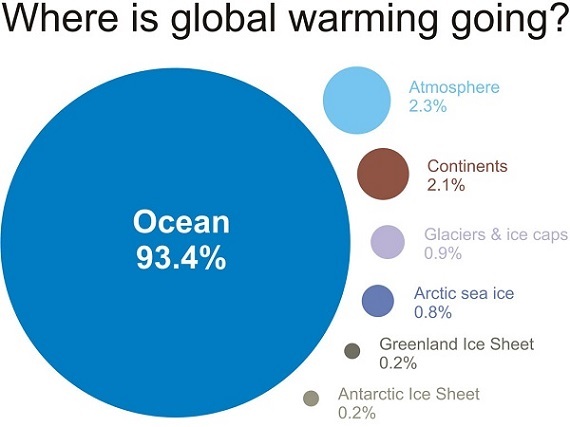 What we do know is that both have been inhibiting warming in recent years. The ‘pause’ effectively goes away. 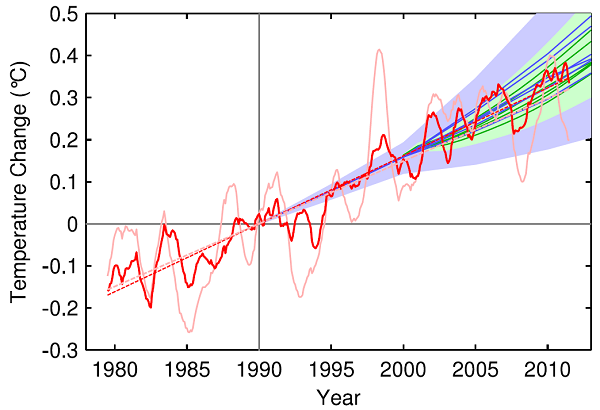 Rahmstorf did predict that when we had another El Niño year a new record would be set. 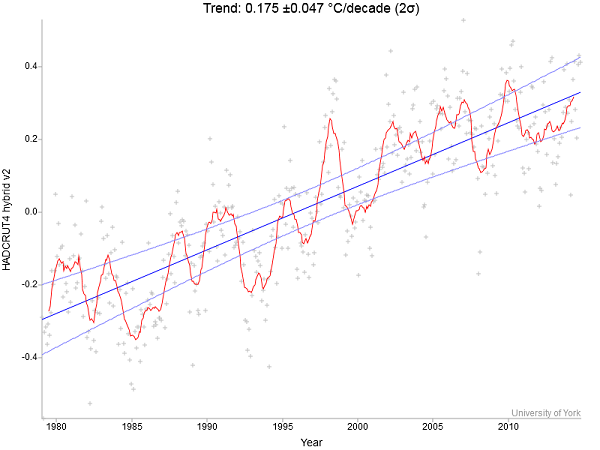 2014-15 is not an El Niño, not yet, but is being heralded as the warmest ever. I’ll wait for it to actually happen before reporting on it further. Meanwhile it’s a fair bet that we will have strong warming in the next few decades. Brian: The key question is what is happening to weather patterns rather than warming as such. Longer, more intense droughts. More frequent/intense weather events etc. are the things that are most likley to destabilize human society. And as the weather patterns change, the ecological services on which our existence is based become more stressed (think pollinators for example). This is an area about which we know virtually nothing. John, I think it’s both and which is more important depends on your situation. If you are relying on snow pack melt for water and irrigation, warming is obviously a worry. In the country where I grew up the weather now seems to happen with a series of exceptional events. They’ve just had one of the driest year’s ever, but recent heavy rains make in an ‘average’ year. Brian: Right about snow pack melt. What are the farm implications around Miles of average years like you describe vs the same amount of rain more evenly spread? John, first up, Miles is forest country with light mineral deficient soils. I’m really talking about the brigalow country around Wandoan, the next town north. There used to be quite a lot of cropping in the area, wheat in the winter and grain sorghum in the summer. You could reckon on good seasons about two out of three years. Now the regularity of rain for planting and growing is not there. A few years ago they had record yields but it was too wet to harvest. Many have turned more to beef. Growing cattle is obviously difficult when you get insufficient rain to grow grass 10 months out of 12. Much of the grazing country further west and north was literally under water a few years ago. Then nothing for a couple of years. Perhaps feeding some breeders, so you can begin again. But one bunch of rain is not enough to grow an animal to produce some income. So the intermittency is really problematic. Rainfall reliability, inland off the coast, has always been elusive in this country. Ive long wondered why mining companies are forced to ” rehabilitate ” the inland sites rather than work into their proposals a better use for the overburden and big holes for water storage. You have insight into this area John, is it a residual chemical problem from the mining process or something ? Jumpy: Water storage in mined out holes depends on what is being mined. The presence of pyrites and other metal sulphides will make the water acidic. This rules out coal mines as well as numerous other mines, even when the target mineral is not a sulphide. Toxic metals such as lead, zinc, arsenic and copper may also appear in the water if they are in the ore or country rock. Cyanide waste from gold processing can be a problem too. Brian: Part of the problem is that we persist in farming animals that breed slowly and take a long time to produce a saleable animal. By contrast, successful native dry country animals (and rabbits) breed prolifically and grow large enough to breed very very quickly. We also farm a lot of plants that need “good follow up rain” to produce a crop. The successful natives are able to produce seed without the follow up rain, have roots that go down to the water table or are able to survive without water for a long time. Using temporary dams to recharge aquifers, breed fast growing fish and/or provide enough irrigation to be sure that crops will mature. Cubby station is an example of this. On the subject of aqua culture I saw a chef commenting that it is important to grow food with taste in mind. I don’t know if this product passes that test, or whether it has other animal waste such as chicken offal, but it looks promising and is yet another income earner from the CSIRO. Bilb: It is a bit hard to tell from the article whether the invention converts prawn farming into an efficient way of producing protein or simply provides an important environmental/taste bonus. Obvious question is can something be done to avoid the need for wild fish feed for fish farms? I gained the impression when I saw the item first, John, that this was a total food, but reading the article that seems not necessarily so. Ithink that there was a hint that the basis is algae, but I’m not even sure of that. Regardless by all reports the product works wonders. 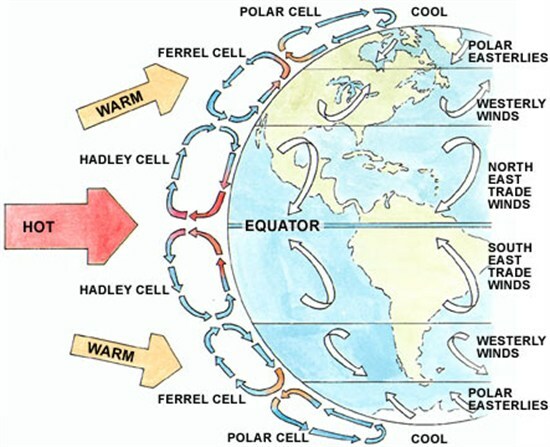 Brian, examining the global air circulation diagram above, I hadn’t noticed previously the circulation direction of the ferral cell which if true creates a difficulty for my air circulation thinking. I have to do more research. BilB, if anything I think the Ferrel cell is bigger than the Hadley cell.